I woke up at 4 a.m. on the morning of June 21 and when I sat up to get out of bed and go to the bathroom, I was pretty confident that my water had broken so I woke Ryan up and immediately called the doctor to let them know. I was prepared to labor at home for a while because that's what everyone (including nurses) had told us but when we called the doctor, they said I can go ahead and head to the hospital. Ryan and I looked at each other confused because we hadn't even started timing contractions yet. The main entrance of the hospital didn't open until 6 a.m. and I really didn't want to go through the E.R. so we decided to eat some breakfast, shower and finish packing the last of the hospital bag before we left. 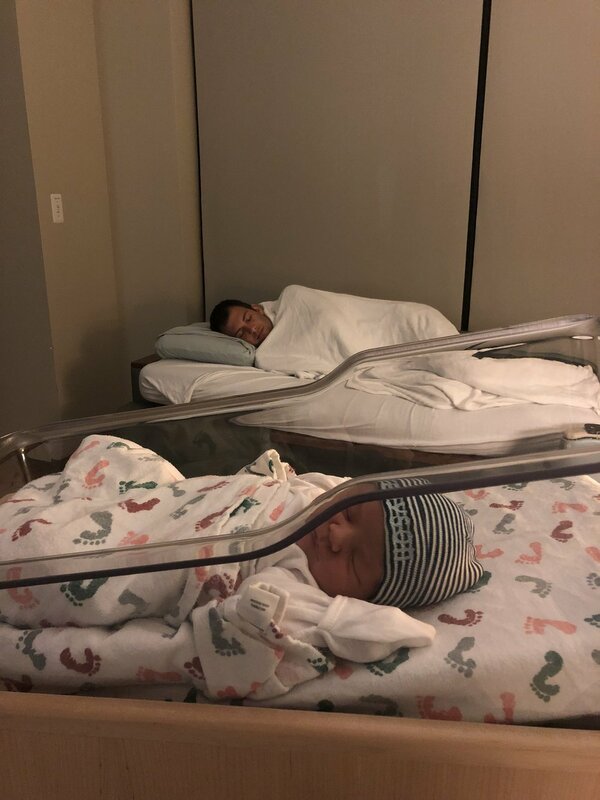 While we did all that we started timing the contractions and I was immediately at the 5-1-1: 5 minutes between contractions, lasting a minute for at least an hour, which is when they tell you to go to the hospital. Ry and I got to the hospital around 6:15 a.m. and they brought me back to confirm that my water had broken and to see how far along I was. The initial test came back and said that my water hadn't broken and I was only at 1 cm (I had been 1 cm for two weeks prior) and I was devastated. Going to the hospital early was a fear of mine and I thought I was in pain then and they were telling me my water hadn't even broken! A few minutes later, the nurse had come back and said the second test that they had run confirmed that my water had in fact broken (I had a high leak so it was harder to detect) so they were going to admit me. I was so relieved! After about an hour and a half, the doctor had come in and I was 2.5 cm and moving along slowly but surely. At that point I had decided that I was going to have an epidural so they started my fluids. About 2 hours after the epidural, the doctor told me I was at 8 cm! I couldn't believe it- I definitely thought the entire process would take much longer and move centimeter by centimeter but here we were just a couple of hours from meeting our baby! My nurse came back in about an hour later and said that this baby was on his or her way and it was time to start pushing. Forty-five minutes later Grayson Jay showed up at 3:53 p.m. weighing in at 9 lbs and 22 inches long. We alll couldn't believe that he was so big and were so excited to finally know him! I got a lot of questions about not finding out the gender and if I would do it again- I think it definitely added to the suspense and emotional aspect of his birth. It was so fun as nurses and the doctor came in excited about the "surprise birth" that the whole experience was really wonderful. Overall, I'm not sure if we'll find out the gender with the next one but I am so incredibly grateful that Ryan convinced me to do it with Grayson because it definitely added an element of surprise and joy to his arrival that can't be replaced. The birth of our baby boy was the most emotional experience I have ever had. I know that seems obvious but when people told me that beforehand, it was hard to believe but I was definitely a hot mess when they put this boy on my chest. Ryan and I were both so overwhelmed with happiness that our son had arrived. Grayson Jay- your dad and I love you with all of our hearts and can't imagine a single day without you with us. We're so excited for the journey ahead and to be by your side as you grow each and every day. I have to say Nordstrom's is really my go to place. I will pick up some stuff from Lucky or a few stores here and there but when in doubt, I always resort back to Nordstroms (sorry wallet!) Given that I feel like I'm the size of a cow right now, shopping isn't the experience it used to be so enter: this post. I couldn't help search one of my FAVORITE sales of the year and share what pieces I'm totally swooning over. The sale runs until 6/3 so make sure to snag up your favorites asap- so excited for summer pieces! Hi! So in all honesty, I really did maternity photos (aka 15 minutes of giving my mom the camera and directing her through it) because I realized I hadn't taken many photos in general throughout this whole process but it wasn't something that I was obsessed with the idea of doing. I knew I wanted to photos to look back on but the newborn ones are much more important to me. What do I wear? Try and find something that flatters the bump while also finding something your comfortable in. Like I mentioned, this dress fit but this is not usually the coloring I recommend. 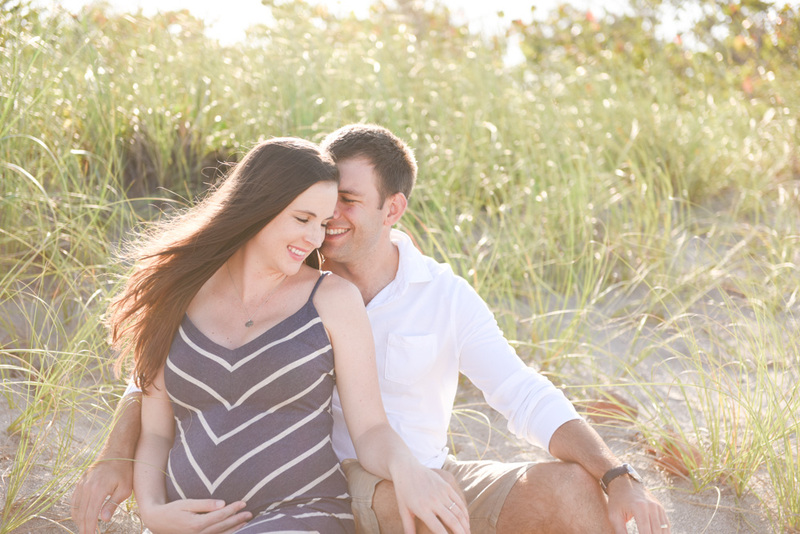 For beach shoots, I find pastels look really pretty with khakis- it just compliments the sand and that beach grass really well. Also, keep in mind- if you're doing a long dress, if it's one similar to mine, you will have to pretty much always have a hand below your belly to show off the bump. If you don't want to do that, look for something like Stephanie's red dress here where the bump is plenty accentuated on its own. Another side note (which I did not follow) is that if you want to mix it up, it helps to go with texture as opposed to patterned. So you can put a chunky open sweater on if it's colder or something along those lines. It's a save way to add some depth without worrying about conflicting patterns. How do I choose a location? Honestly, a lot of people ask me this as the photographer so your best bet is starting there. They know the best local spots and the best times to go. Now if you're pulling a me and doing it on your own, focus on a beach or park where you know you can at least have a little separation so you don't have to deal with cars in the background or people constantly walking through the shot. How do I not look awkward? So I struggle with this on the reg. Which is why I'm the photographer not the subject. When it all comes down to it, don't force it. I try to start in regular poses that you would do regardless of being pregnant- typical standing next to each other, hugging from behind, those sorts of things and then adjust for the bump. My (personal) view on maternity photography is it's more like an engagement shoot with a belly as opposed to focusing on it. Now A LOT of people see that differently, so that's just my opinion but it certainly helps you feel a little less awkward. 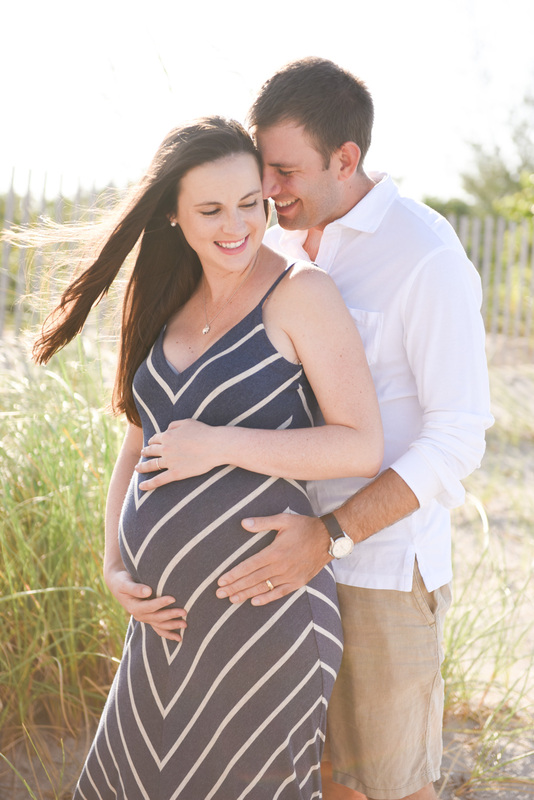 Comment below if you have any maternity shoot questions!